Contemporary oil paintings by Anne Rowe based on historic photographs will be featured at the Arts Council of Southeast Missouri in February. Cape Girardeau, MO -- Historic oil portraits and handmade quilts will be the focus of the Arts Council of Southeast Missouri's February First Friday gallery opening Friday, Feb. 5, from 5 to 9 p.m. at 32 N. Main in Cape Girardeau, Mo. A collection of works titled "Tribute -- Illustrating the Past" by Anne Burgess Rowe of St. Louis, Mo., will be on display in Gallery 100. This exhibit is a series of contemporary paintings based on Rowe's collection of black and white photographs dating from the mid-1860s to the 1920s. 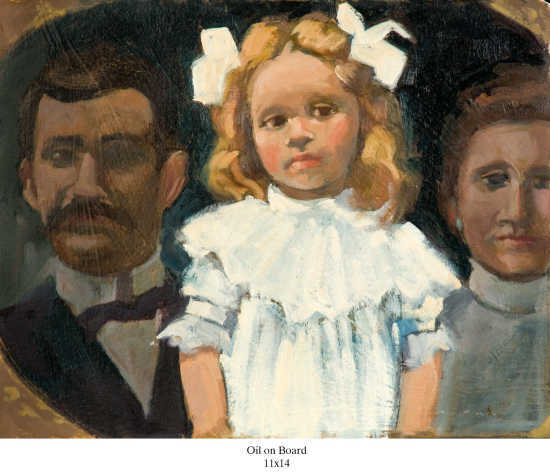 Many of the photos and paintings are of the artist's family. The collection features a total of 25 paintings in walnut frames custom made by Rowe's brother, George Burgess of Winchester, Va.
During February, the Arts Council also will host The River Heritage Quilters Guild in the Lorimier Gallery. This display will include a variety of artfully made quilts, including the winning quilts from the guild's second place finish in the group competition category of the American Quilters Society's annual show in Nashville, TN in 2008. Quilts feature themes ranging from African culture, to vintage sheet music and even a beach scene. The River Heritage Quilters Guild, formed in 1989, includes over 125 members and holds meetings at the Cape Girardeau Public Library at 6:45 p.m. the second Monday of the month. New works from the Local Artists Co-Op will debut in the Arts Council's Gene Chapman Gallery and a new collection of fine art miniatures will be available for sale. This month's First Friday reception features food by Mediterranean on Broadway. Reception wine is provided to the Arts Council by Major Brands. The Arts Council of Southeast Missouri is located at 32 N. Main Street in Cape Girardeau, Mo. Gallery hours are Tuesday through Saturday from 10 a.m. to 4 p.m. This 501 (c)(3) non-profit organization was founded in 1961 by metalsmith Otto F. Dingeldein, to encourage artistic awareness, participation, and expression. By showcasing the arts we hope to stimulate the exchange of new ideas and build a shared sense of community. Find us online at www.CapeArts.org, www.Facebook.com/CapeArts or www.Twitter.com/CapeArts.